F. H. Bradley (1846-1924) was the foremost philosopher of the British Idealist school, which came to prominence in the second half of the nineteenth century. Bradley, who was a life fellow of Merton College, Oxford, was influenced by Hegel, and also reacted against utilitarianism. He was recognised during his lifetime as one of the greatest intellectuals of his generation and was the first philosopher to receive the Order of Merit, in 1924. His work is considered to have been important to the formation of analytic philosophy. In metaphysics, he rejected pluralism and realism, and believed that English philosophy needed to deal systematically with first principles. 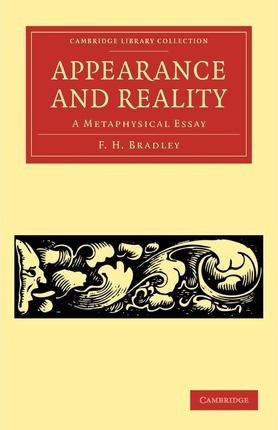 This work, first published in 1893, is divided into two parts: 'Appearance' deals with exposing the contradictions that Bradley believed are hidden in our everyday conceptions of the world; and in 'Reality', he builds his positive account of reality and considers possible objections to it. Preface; Introduction; Book I. Appearance: 1. Primary and secondary qualities; 2. Substantive and adjective; 3. Relation and quality; 4. Space and time; 5. Motion and change and its perception; 6. Causation; 7. Activity; 8. Things; 9. The meanings of self; 10. The reality of self; 11. Phenomenalism; 12. Things in themselves; Book II. Reality: 13. The general nature of reality; 14. The general nature of reality (continued); 15. Thought and reality; 16. Error; 17. Evil; 18. Temporal and spatial appearance; 19. The this and the mine; 20. Recapitulation; 21. Solipsism; 22. Nature; 23. Body and soul; 24. Degrees of truth and reality; 25. Goodness; 26. The absolute and its appearance; 27. Ultimate doubts; Index.